I saved one for last, it's the entrance way to the castle. Click this link to see the rest of the series of photos from this beautiful castle. 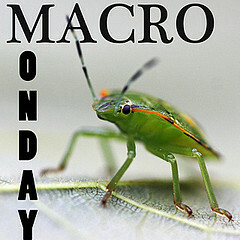 Macro Monday is easy to play, snap a macro (or any close-up) photo and post it on your blog! Click this link to see more photos of this beautiful castle. It's easy, grab your camera, post some of your favorite photos of the week that has past and join the fun! 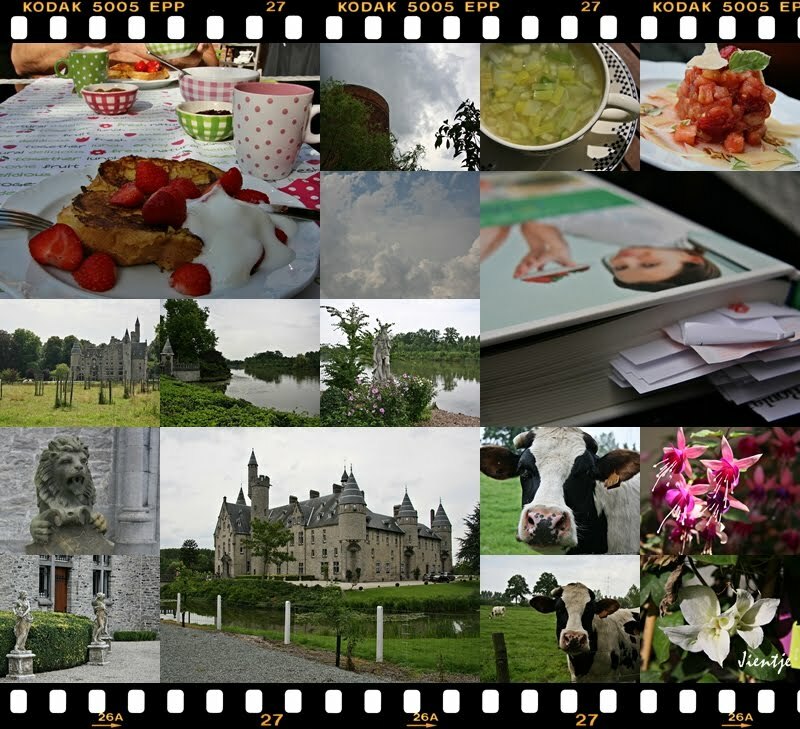 My favorite photos this week are from the Chateau Marnix de Sainte Aldegonde in Bornem. It looks like a castle from a fairy tale, and is completely furnished and decorated inside, as the owners still live in it. Unfortunately, we were not allowed to take photos inside, but the beautiful views of the castle and the river Schelde where it is situated made me glad I did bring my camera! This is the view from the backside of the castle. 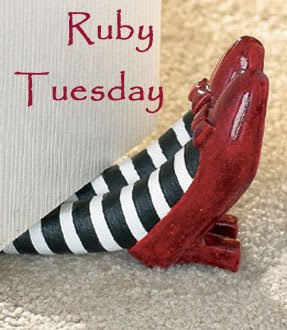 It's Friday again, time to reflect on the week that has passed and post about five favorite things from your week. Friday's Fave Five is hosted by Susanne at Living to Tell the Story, if you're looking for the rules, they're here. It's been a beautiful week, with some very nice sunny days, and of course a little bit of rain as well. We wouldn't know we were in Belgium if it were different! 1. Sunday morning breakfast. I always try to make it a little bit special. This week was very special because the weather was nice enough to be able to eat outside in the sun. The new cups and bowls made the table extra cheerful. Because I'm still watching my weight, I made a low calorie version of eggy bread. I used sweetener instead of sugar and used the oil spray to grease the pan to bake them in. I served it with fresh strawberries and low fat fresh cheese. 2. We visited Chateau Marnix de Sainte Aldegonde in Bornem. A beautiful castle, exceptionally open to the public. The owners still live in it, and it is completely furnished and decorated. We were not allowed to take photos inside though, but the views outside were also stunning, so I still was glad I brought my camera. 3. Cows. Whenever I see cows, I want to photograph them! 4. My Weight Watcher's cookbook. I love to read in it and get ideas for low calorie meals, snacks, breakfasts and lunches. There are lots and lots of delicious recipes in it, I already tried a couple of them and they were a great success. 5. Fresh soup. Nothing like a good bowl of fresh soup with a slice of homemade bread! Absolutely no calories ( well hey, OK correction ... very low calorie ) and very satisfying! Last week I showed you a street view from Le Barroux, and this week I'm taking you all the way to the top of this little sleepy village. All the way up, overlooking the village is this huge twelfth century castle which was rebuilt in the 16th century and restored in 1960. Midweek Blues, Music Maestro Please! The medieval musicians at the festival made a perfect Midweek Blues trio! These two ladies were cutting vegetables to make soup at the medieval festival at Horst Castle. It's easy, just post a photo with a little or a lot of red and add your link to Mr Linky, and then visit some of the participants from all over the world. I was at the medieval festival at Horst Castle last week. Lots of performers and artists in medieval costumes for me to photograph! 1. 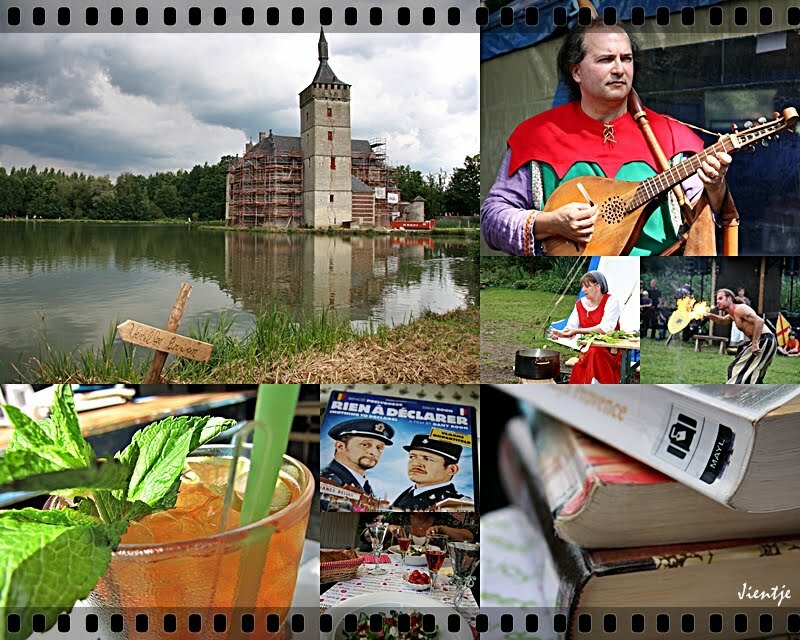 There was a medieval festival in the historical setting of Horst Castle this weekend. Some of you may remember this castle from a header photo I used in the past. The castle is now being restored, so unfortunately it's a little less photogenic than it used to. But there still was enough to see and to photograph. A juggler, a torch blower, musicians ... all kinds of crafts ... knights in shining armor and people dressed up in medieval costumes ... lots of things going on to keep us busy all day! 2. My husband is MY knight in shining armor, and he loves to surprise me with little gifts. This time he bought me a DVD with the French movie " Rien a declarer?" It's a comic movie about the French and the Belgian border guards just before the borders between France and Belgium disappeared. 3. The library. I've been reading quite a lot lately - sometimes I read a book in only one day - so it's nice to be able to borrow my books from the public library in my community. 4. Eating outside on my patio is always a favorite of mine during Summer. The weather has not been terrible lately, but as long as it's not too cold, I just LOVE to eat outside. This week my friend Nana came over for lunch and it was a real treat to be able to sit in the sun for a change! 5. Home made ice tea. Nothing like home made ice tea. I add a few slices of lemon, and a cinnamon stick for a little extra flavor and some sweetener instead of sugar,this makes it a very refreshing low calorie drink. a small perched village between Carpentras and Vaison La Romaine. Can you believe it's Friday again? Where has the week gone to? Time to reflect on the week that has passed and post about five favorite things from your week. Friday's Fave Five is hosted by Susanne at Living to Tell the Story, if you're looking for the rules, they're here. It's been a bit of an uneventful week, but I still have managed to find five favorites. 1. We cleaned the concrete tiles on our patio with the pressure washer. Now that the plumber has solved the leakage problem we can finally clean the floor of our patio again. I added a before and after picture, because I can't believe how clean it now looks! 2. My herb garden. 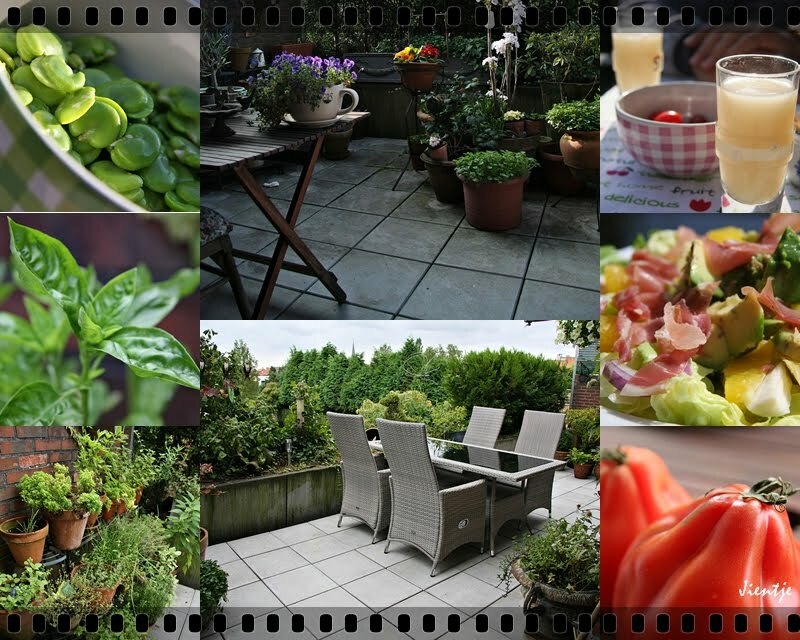 I just love to use fresh herbs from the potted herb garden on my patio. Can't imagine Summer cooking without them. 3. Avocado and orange salad with little slithers of Parma ham. I made this for lunch yesterday. 4. Broad beans or Fava beans. I saw some at the weekly market and just had to bring them home. It does involve quite a bit of work ( you have to remove the pods first, then boil the beans for a couple of minutes and then remove the shells ) but I don't mind, they're worth it. 5. Pastis as an aperitif. It's an anis flavored liqueur, diluted with ice water. It tastes even better when the sun shines, it reminds me of our holiday in Provence! I almost walked past this faded door but then I saw the painted tree branch, so I took my camera and looked a little bit closer. Much to my surprise I discovered these painted kitties right at the bottom of this door.